In this week’s episode of Meta Fix, Jason takes the time to delve into the much anticipated discussion of resources and their impact on the current Meta Game. From the Infinity Gauntlet, Utility Belt, Penguin and Power Plant to the Book of the Skulls and the Phoenix Force, find out what Jason thinks is the best suited for a 300 point competition. One of my favourite characters from Legion of Superheroes is Luornu Durgo aka Triplicate Girl. When I first heard the set (Superman and the Legion of Superheroes) was coming out I was really excited for the chance at getting an updated version of her, especially since we hadn’t seen her since the REV days of Origins. I just knew they were going to use the new game mechanics (like Special White Powers, Traits, Improvements etc) to make her even more awesome and I was not disappointed. The two versions of her that came in the set (Main Set and Gravity Feed) have traits that work off her powers to make duplicates of herself – she’s not quite on the level of Marvel’s Multiple Man, since she can only split into three but I expected them to use a similar mechanic. My favourite of the two is the Gravity Feed version as the main set gets a little too expensive to have the extra Triplicates on the board (213pts for a full trio) Her trait reads as such: TRIPLICATE GIRL AND DUO DAMSEL: When you set up your force, place two Triplicate Girl bystander tokens, as described on this card, on the map adjacent to Triplicate Girl. They replace their combat values with Triplicate Girl’s current printed combat values and they can use any powers that Triplicate Girl can use. When one of them is KO’d, Triplicate Girl can use Willpower for the rest of the game. When Triplicate Girl would be KO’d, KO a friendly bystander token named Triplicate Girl instead, if there is one, and heal Triplicate Girl to click #7. This ability can’t be ignored. 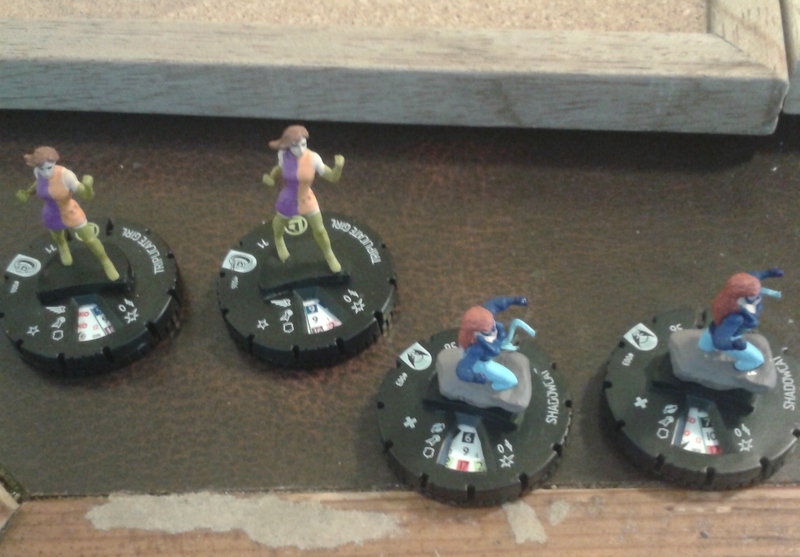 I love the inclusion of bystander tokens in this way, it gives a lot of room for themed play when a character comes with it’s own bystander token (much like Fantomex or Alyosha Kraven) However I don’t own a printer for the easy solution that Print and Play offers and I like having something physically on the board over having a placeholder like a poker chip so I decided to mod my Triplicate Girls. I didn’t want to just cannibalize the sculpt and leave it at that – we did pull five from our three bricks so it wouldn’t have been a problem – I wanted to still be able to use the Main Set figure so I decided the best thing to do would be to turn her into a Switch Clix. The standard Switch Clix unfortunately was not going to work for me since the holes that the click sits in are actually part of the top dial and I didn’t want to replace the entire top dial (I still wanted her to be playable as her 71pt version) but I remembered that there were two Switch Clix in Wolverine and the X-men that were based on pegs coming up from the dial instead of going down into the dial – Shadowcat and Toad. We pulled the most of Shadowcat so I chose her. 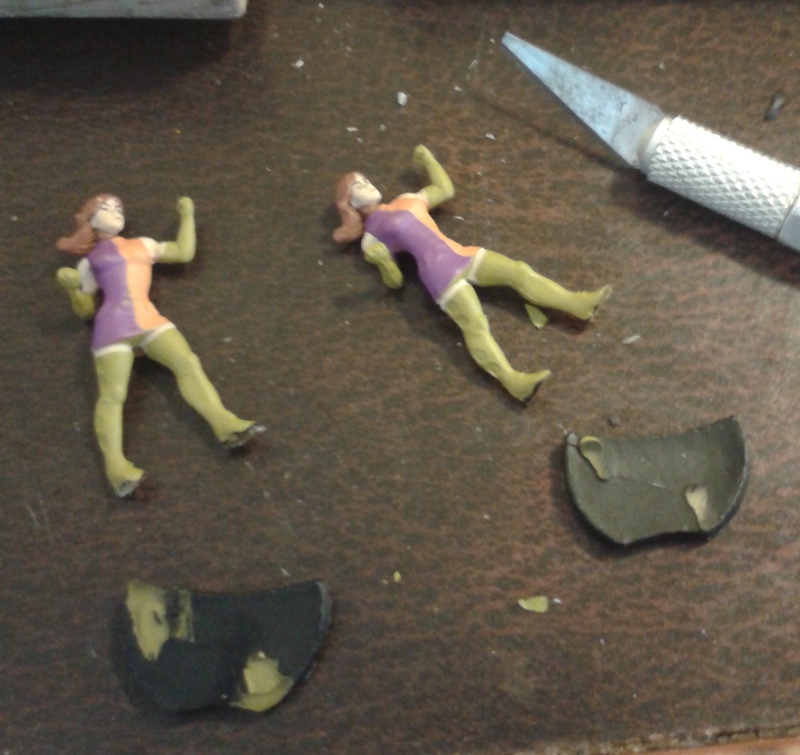 The first thing I had to do was remove Triplicate Girl’s sculpt without harming her and remove the sculpt pegs from Shadowcat’s dial without breaking them. I used a metal nail file to dig under the plastic. Once I got a small opening it was easy enough to pry the rest off. The plastic itself was rather pliable and was easy to separate from the glue without causing any damage to the actual plastic. 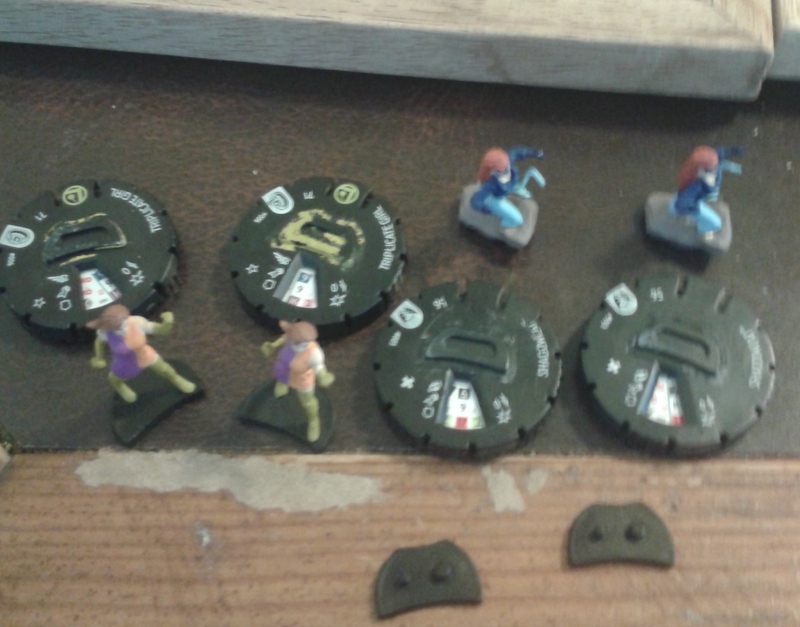 Now that the caps were off it was easy enough to glue the Switch Clix peg cap onto Triplicate Girl’s dial. The only problem I had was my glue getting a little over excited and I had to scrap some excess glue off the top of the dial before it completely hardened. 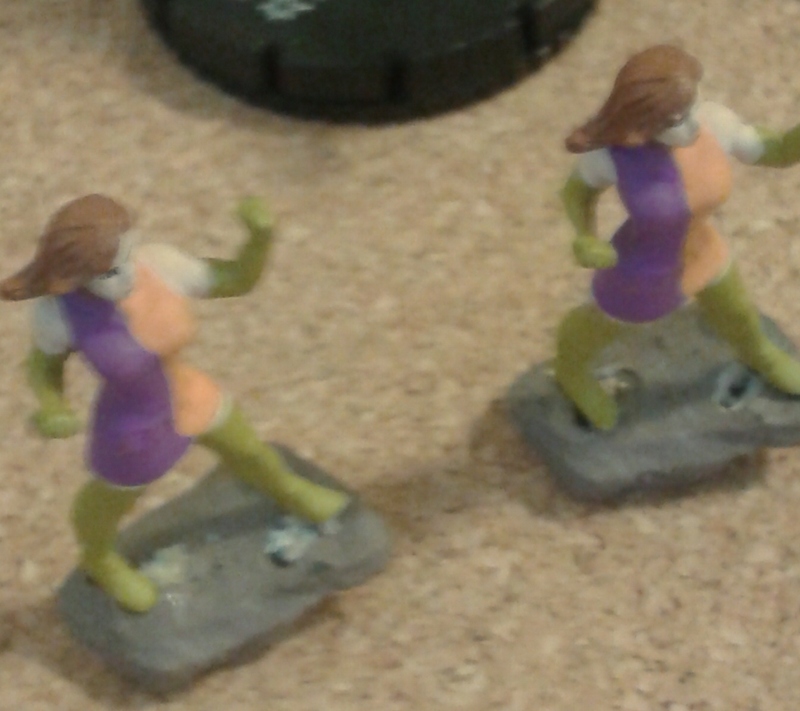 I put that aside to let the glue set and went to work switching the girls themselves. 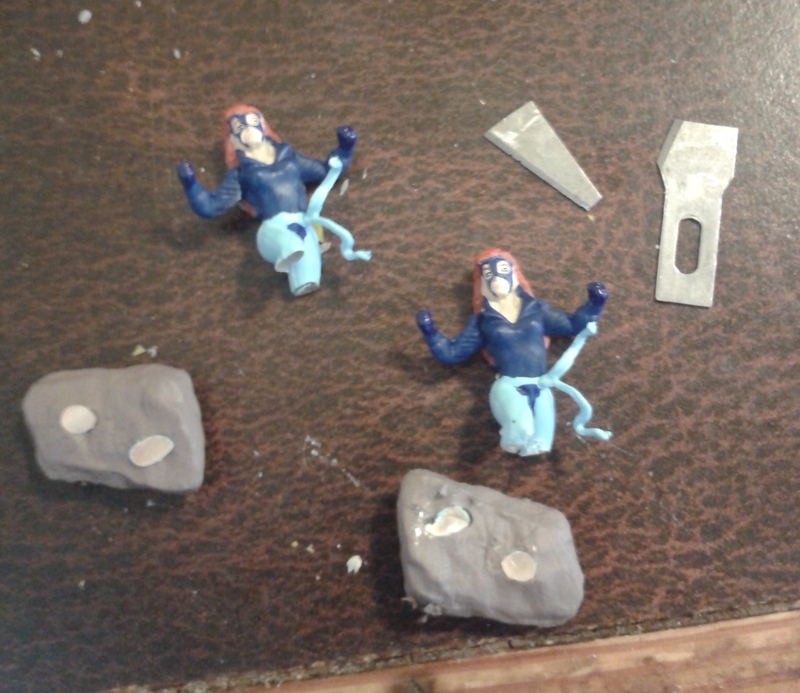 To make the Switch Clix work I had to take Shadowcat off her rock, Trip off her cap and then glue Trip onto the rock. The plastic they used in SLoSH appears to be more malleable and pliable and made it really easy to cut Triplicate Girl off her cap without harming the figure herself. I used a standard exacto knife to do so. Shadowcat proved to be a little harder, the plastic is a bit more solid and my knife was old so I managed to get her off but snapped the blade in the process. This also left me with bits of her thigh left in the rock that I had to pry out. Now that I had my pieces disassembled all that was left was to reassemble them. 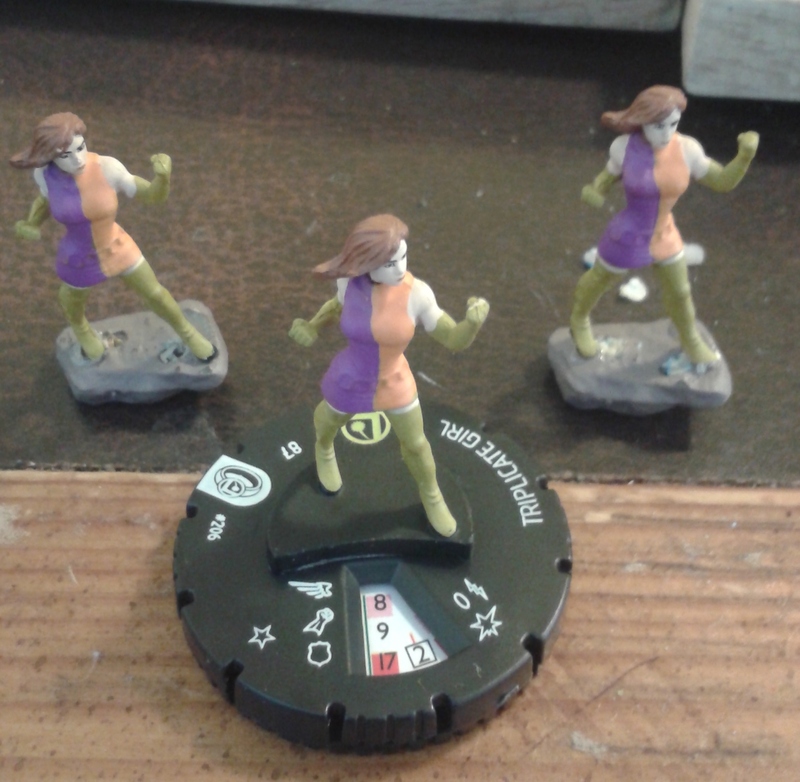 Thankfully the pose that Triplicate Girl is in worked out perfectly to mount her on top of the rock. Now I have a set of Triplicate Girls that I can easily play on their 71pt Main Set dial or pop off to accompany my 87pt Gravity Feed dial. I have to touch up the glue spots a bit to get the crust off of the peg cap and the rock could probably use a nice new coat of paint but overall, for an experiment, I’m really happy with how it turned out. Superman and the Legion of Superheroes has now come and gone and here at Married With Clix we opened up three bricks of pure Superhero goodness. Jason and Amber unbox a full case of the set for you and then Amber gives an indepth look at the figure sculpts of the set. All Commons, Uncommons and Rares are shown with a mix of Super Rares and Chases. This past weekend our venue held their Month 2 of the AvX Story line Event. With Jason representing the Avengers and Amber holding strong for the X-Men find out how they faired against the competition. Get your Fix on with Meta Fix. In this week’s episode Jason examines the effectiveness of MinMaxing characters (using characters with minimal cost and maximum output) as well as Non Free Actions as Actions. Avx Primer Week 2 has come to an end. Enjoy games 4 and 5 and stayed tuned this weekend to find out how Amber and Jason did at their local venue for their AvX Month 2 Storyline Event Tournament. 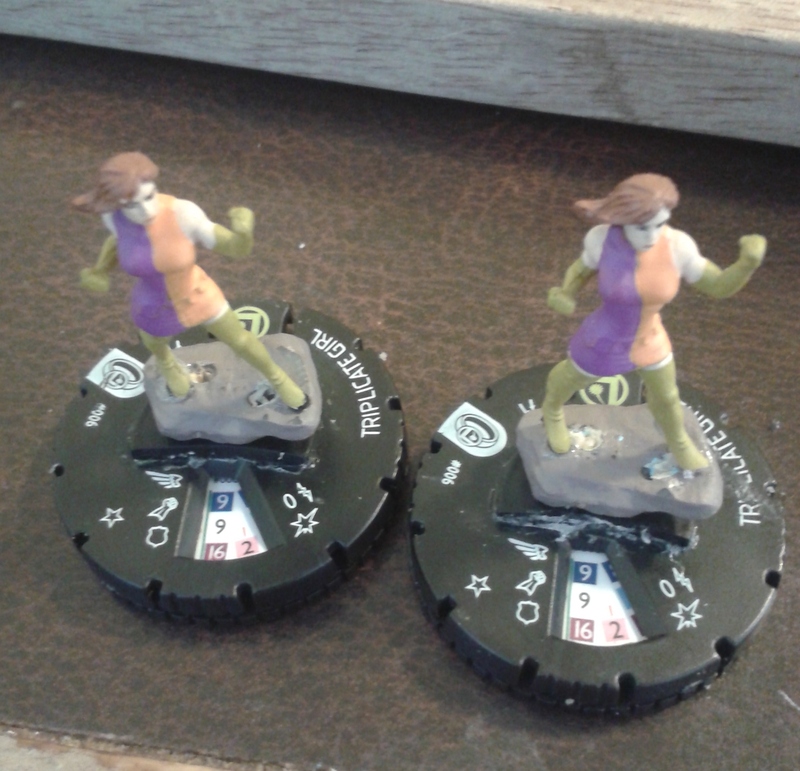 AvX Primer Week 2 continues over at Married With Clix, bringing you Games 2 & 3. 400pts pure constructed with at least 1 figure from respective Starter Kits – Jason for Avengers, Amber for X-men.